SellerActive has unveiled an updated inventory management dashboard for multichannel merchants, which aims to be more user-friendly and better display important information than the previous version. The dashboard’s new design clearly displays important seller information with graphs, charts and hover-over tool tips. Plus, sellers can view their top five products, the number of orders awaiting shipment, as well as inventory and sales data. 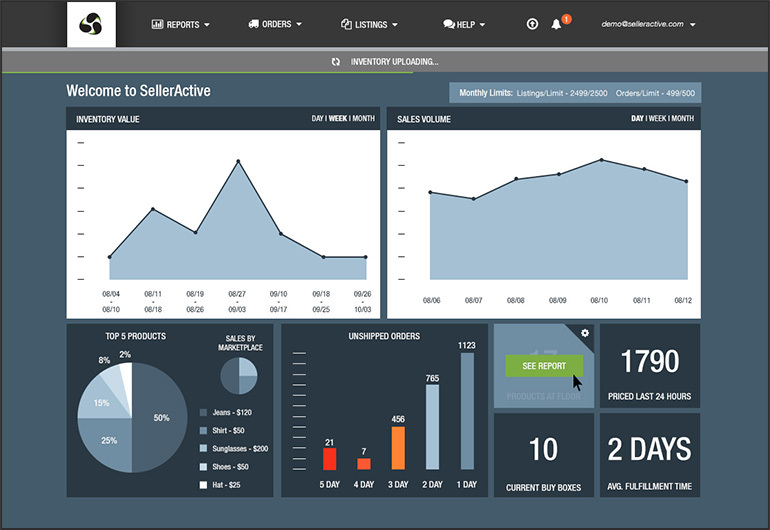 "The new dashboard design is just the beginning in empowering current and future customers to tap the full potential of SellerActive's robust suite of tools," said SellerActive technology manager, Travis Tomlinson. "Along with the addition of new features, we've also made our current tools even easier to access from the dashboard. With more improvements lined up for 2015, we're positioning SellerActive to be the premier inventory management software of multichannel sellers." It is important to note that the updated dashboard is just the latest in a string of developments from SellerActive, which include product bundling, an easier upload process and low-stock warnings. Plus, more integrations and features will be arriving soon.